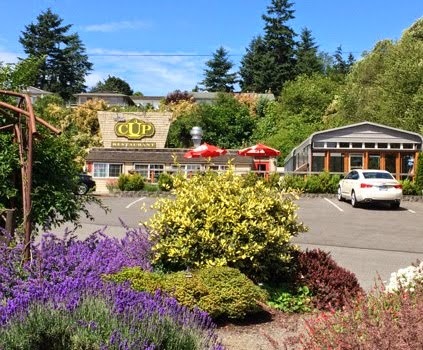 The Cup Restaurant in Port Townsend is a special place to enjoy breakfast, lunch and dinner in Port Townsend. The food is always the freshest. The chef and his cooks prepare the meal from scratch everyday. No canned food off the truck here. From Cape Cleare salmon to the highest quality Angus beef, the meals served in The Cup are a sure bet to excite your taste buds, satisfy your craving for high quality food, and bring you back for more. potatoes, two eggs and choice of toast. english muffin, topped with homemade Hollandaise sauce. Bourbon Street sausage and herbs. Bourbon Street sausage or Garden sausage. muffin, topped with homemade Hollandaise sauce. cheese on top of Home fried potatoes. Black Forest ham, cheddar cheese and caramelized onions. toast, served with salsa and sour cream. Black Forest ham or Garden sausage. Fresh spinach and havarti cheese. fresh spinach and Garden sausage. Fresh chives and cream cheese. cheddar cheese, special sauce, lettuce and onion. 10 oz. Cup of Soup and 1/2 Sandwich. Three piece battered Cod with fries and slaw. lettuce, tomato, swiss and cheddar cheese. Daily’s bacon, crisp lettuce and tomatoes. Black Forest ham grilled with jack and cheddar cheese. diced tomato and avocado, grilled chicken and bacon. * Consumption of Raw / Undercooked food may cause illness. On Thursday, Friday and Saturday evenings the chef prepares a special dinners. For an intimate sense of the spirit of The Cup, nothing can convey it better than the writer Michael Raymond, who jotted these notes in his book Snippets of a Life. 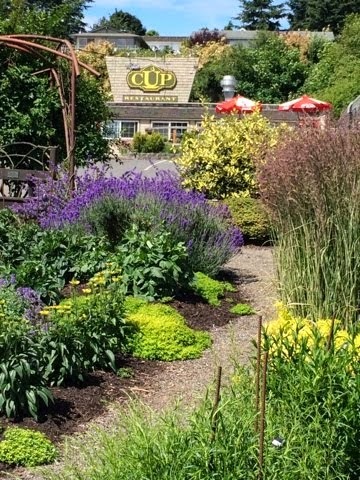 "The Cup is a quiet little diner, overlooking the mill town of Port Townsend and it s the setting for a familiar scene I enjoy. 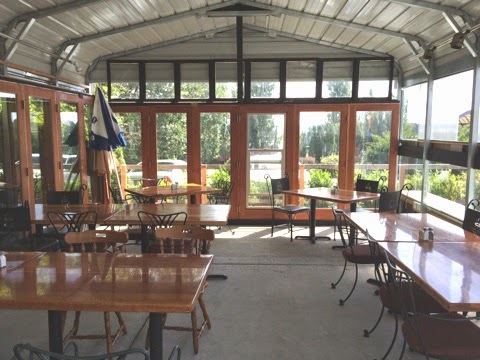 At different times over the past years, work has found me traveling to Whidbey Island for various tasks, and if I happen to get on the road too early, stopping off for a cup of coffee or a spot of breakfast at this local favorite while I await the next ferry. 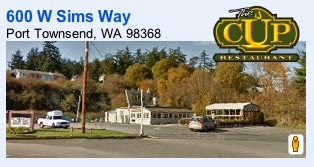 Regardless of when in the morning I might happen to stop by, two things I will find of which I'm certain, a good meal and the unrequited company of "Cliff" and "Norm" occupying their favorite corner table. Cliff and Norm are just two of the local townsfolk who frequent the small diner for a seemingly daily ritual of breakfast or coffee and the enjoyment of pleasant conversation with good company. What their real names are I don't know as we have never met, but then again it doesn't matter. What matters is that these two particular gentlemen are true characters in their own right and are part of a Norman Rockwell Americana that might transpire at any given moment in any small town in our world. I name them Cliff and Norm from two affable characters from the TV series "Cheers," a favorite show base loosely around the Bull and Finch Pub in Boston, Mass. While the men here today carry on much like those two beloved characters. 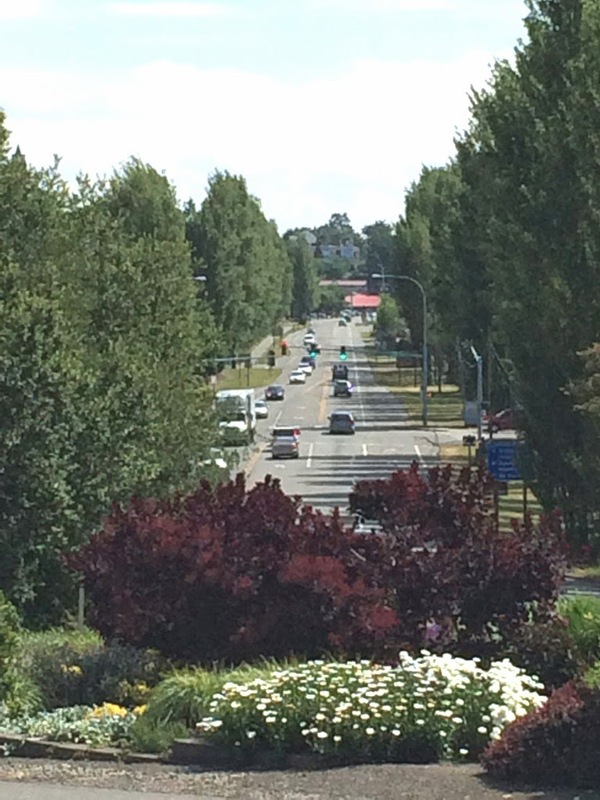 I must mention that the Port Townsend "Cliff" is far brighter than the TV version played by John Ratzenberger. While Mr. Ratzenberger's character spins a wholly fictitious (if not slightly believable) yarn about the smallest of trivia, this true life gentleman appears genuinely educated and passionate about the daily goings on within his world. Therefore, their conversations are genuine and engaging. 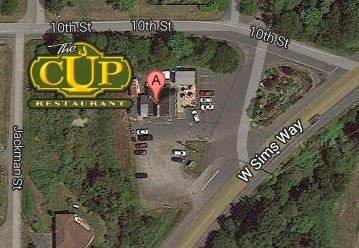 During any one of these stops for coffee, Cliff and Norm can be found at that favorite table. Never seeming to be in a hurry to be somewhere else most times will find them enjoying the added company of another local making what could be construed as a "guest" appearance for the morning talk show. As is usual, the typical morning conversation runs a wide gamut of topics, from sports to politics and economics, to much ado's about Peninsula news, and even to today's subject, something I would describe as geological miscalculations of certain dredging operations in the upper western regions of North America. Regardless of the topic for the daily chatter though, it is clear that these two friends thoroughly enjoy their time together in both idle and animated conversation as they watch visitors such as I wander in and out of their world. 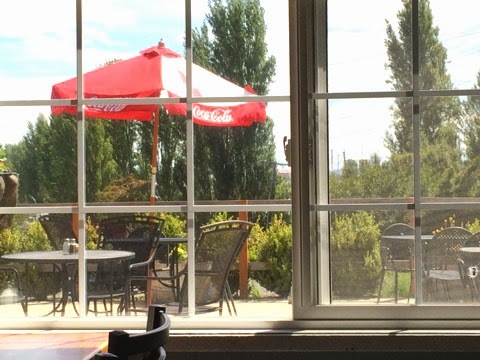 As I finish my meal today and head on towards the ferry dock, it is with an envious twinge that I admire the familiar continuity this scene presents and hope that later years might find each of us enjoying the same; sitting with a good friend, talking over a cup of coffee and enjoying the view from our favorite spot at the corner table." 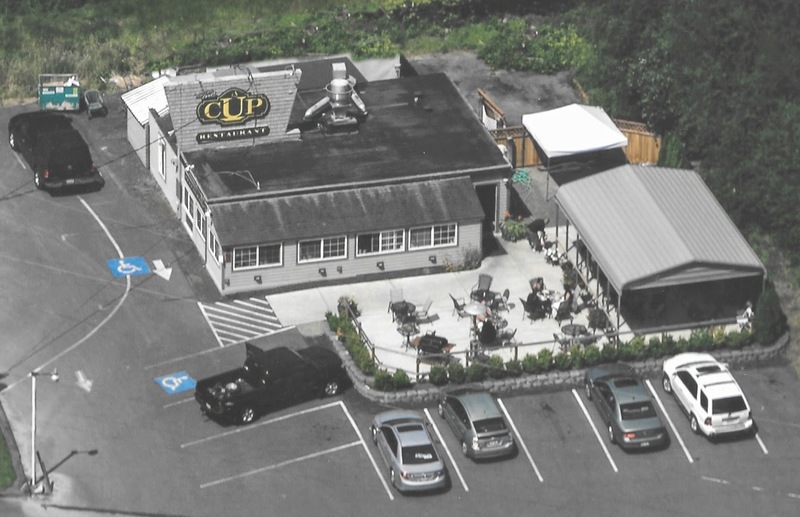 You are invite to stop in The Cup Restaurant to see if you encounter "Cliff" and "Norm" solving the world's problems at their favorite table. 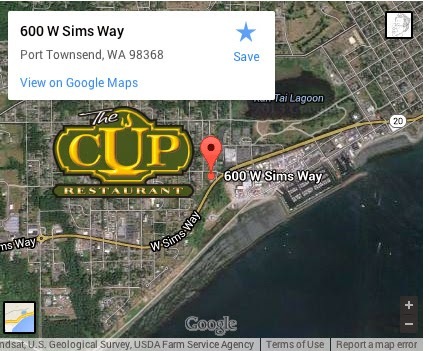 The Cup is located on Sims Way at the Big Curve swinging down toward Port Townsend's boatyards and downtown tourist attractions. The pace is slower here, so you'll have plenty of time to enjoy a tasty meal with your cup of coffee.